The Burlington Northern Railroad built this Miniature Locomotive in 1981 in their St. Cloud car shops for public relations use. It was used all over the BNSF line for years. 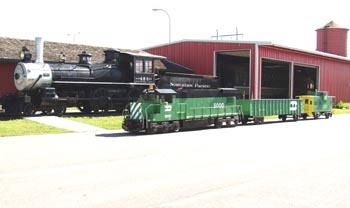 It was given to the City of Dilworth in 1996, and this spring the City of Dilworth and the BNSF Dilworth employee's club, the Red River Rails, donated the locomotive to the Cass County Historical Society for display at Bonanzaville2, where it would be used often for parades and large events. 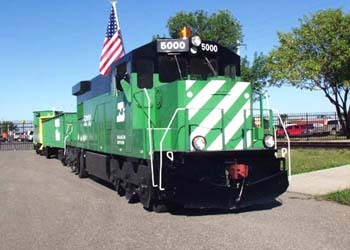 This little 18 horsepower Locomotive was patterned after the 5000 series Northern Pacific Locomotive made by General Electric that was state of the art in 1981. The 5000 Series had 3000 horsepower, one of the largest at that time. It was the pride of the BNSF Railroad. This Miniature Locomotive is based upon a 1981 Cushman Truckster chassis, brand new at the time, which was rebuilt with a much longer wheelbase. It is 20 feet long and just over six feet high and runs on rubber tires suitable for city streets. 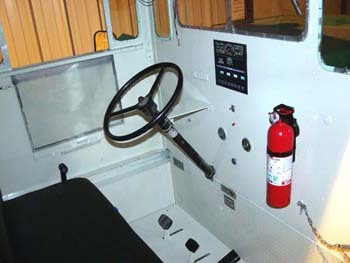 It has a steel tube frame and the entire superstructure is aluminum angle and flat aluminum sheet, all riveted together. It is well built and easy to repair. The Cass County Historical Society is restoring the little locomotive. All it needed in the way of repairs was a new carburetor kit and a tune-up.